I've always loved nice old things and early on I collected the odd set of old pillowcases. My total obsession with vintage linens was born when I inherited my grandma's collection in 2000 when she went to a nursing home. She still had the monogrammed pillowcases she made as a young girl to fill her hope chest and the ones she received as wedding gifts in 1930. She also had beautiful unused table cloths and hand crocheted bedding. While she kept them stashed away for safe keeping, it broke my heart to find all these wonderful things she had been saving to use on some special occasion that never came. I decided I would use them, appreciate and enjoy them, and as they made my home more beautiful I would think of her. The more linens of every kind that I had, the more I wanted. I started scouring garage sales, estate sales and auctions. 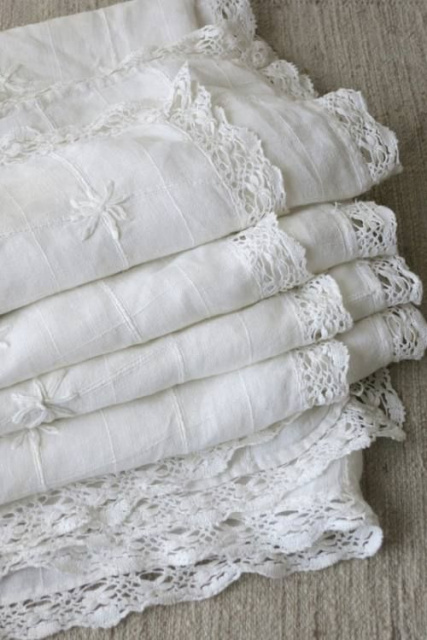 Old linens were made of such greater quality than what you can afford to buy today! The fabric is durable yet soft, and made without harsh chemicals found in modern cloth. They were made to be used and they launder well. And as was the custom of the day, they were made to bring beauty to everyday things. I have so many gorgeous cloth napkins now that I use them for any occasion. If my neighbor drops by then I drag out a plate of cheese and crackers, a bottle of wine, some cute old plates and cloth napkins. Any little occasion is special enough to use a cloth napkin at my house! So please, buy what you love then use and enjoy it. Some of my best finds occur when I buy the contents of a dresser or closet and find unused old treasures from a lady who was saving that special tablecloth and never had a dinner she felt worthy of getting out and using it for. While that tablecloth may not fit any of my tables, but it may be the perfect fit for yours! And while 1960's and '70's linens are all the rage now, it's not the era I collect so I offer them up for sale as well. I've now filled closets and dressers and boxes, and I just can't use them all, so I'm selling the excess. My obsession means I keep buying so my inventory changes frequently, usually weekly. Think outside of the box with old textiles. Sheets can be remade to use as curtains or shower curtains. Dresser scarves and table runners can become valances. A big tablecloth can become a bed cover. Even damaged old lace tablecloths can be remade into curtains where slight defects can be hidden within the folds of the fabric. Although I'm not big into sewing, I used some old embroidered pillowcases to make baby blankets for my grandchildren, and an old linen tablecloth to create some vintage king size pillowcases that I just love. Be sure and shop our VINTAGE LINEN CLOSET. Click any category to see our current inventory - you're sure to find something pretty at a great price! Unless I find an item in its original unopened package, I wash and iron each item before packing it away for resale. So many of the items I find are new, but have never yet been washed. On items that have been used then I try and make note of any damage I find. If you receive something and there's damage that I didn't notice and you can't work around then you're welcome to return it within 30 days for a full refund.